(NaturalSociety) An essential water-soluble nutrient, choline is a compound needed for the most quintessential functions of the body – especially for the liver and nervous system to function properly. While choline is not a vitamin in the strictest sense, it is usually grouped in as part of the B-Vitamin complex. And while this compound is created in small amounts in the liver, it is essential that you obtain even greater amounts from foods. Below, you will learn of 5 easy ways to remedy this lack of choline through diet. 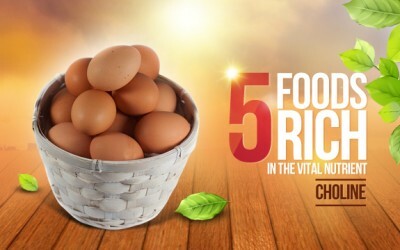 Choline supports our basic cellular structure, nutrient transport, and metabolism. The liver metabolizes choline for use throughout the entire body. In 1998, the Food and Nutrition Board of the Institute of Medicine decided choline, found primarily in egg yolks, was absolutely vital for health. Here’s why. 1. Choline Supports Structural Integrity of Cell Membranes: This nutrient plays a role in the synthesis of phospholipids, phosphatidylcholine and sphingomyelin, the important structural components of the human cell membrane. 2. Choline Supports Metabolism and Healthy Liver Function: Without enough choline, many people suffer from Metabolic Syndrome, a condition involving insulin resistance, elevated serum triglycerides, increased serum cholesterol, and obesity. Without sufficient protein, lack of choline can also contribute to fatty deposits in the liver, leading to numerous diseases. 3. Choline Supports Brain and Nervous System Health: Without this nutrient, cholinergic neurons that make up portions of the brain along with the parasympathetic and sympathetic nervous systems cannot develop. Choline is also a precursor to the neurotransmitter acetylcholine, which is involved in muscle function, memory, and learning among other essential processes of the body. 4. Cancer Prevention & Anti-Inflammatory: Studies consistently find that people with diets rich in choline have the lowest levels of inflammatory markers such as IL-6, TNF-alpha and C-reactive protein. Furthermore, people that don’t get enough choline in their diets (for as little as a month) often have a significantly higher increase in DNA damage and cancer risk. Choline is especially important for mitigating risks of colon cancer. 5. Early Growth & Development: Choline is so important for brain development, that in times past, expecting mothers would eat up to five eggs a day to make sure their developing fetuses got enough of the nutrient. Deficiency during pregnancy has been linked to long-term learning disability and memory problems in offspring. Choline also naturally occurs in breast milk, as young children require a substantial amount to support the formation of the nervous system, which continues at a high rate into the fourth year of life. The presence of choline in breast milk is directly correlated to mom’s dietary intake, however, so consuming appropriate foods should be a priority. If unable to breastfeed, it is critical that babies receive a formula that contains natural choline. As is the case with virtually any nutrient, you will find dozens of different choline supplements on health food store shelves. But make no mistake, food supplementation is the best way to get more choline. Many supplements contain a byroduct from the soy industry (and we all know most soy in the U.S. is grown as a GMO). Soy lecithin, used as an emulsifier in chocolate, but also in many supplements, is not ideal. It is also often chemically extracted using harsh solvents like hexane. Pure whole foods will provide a better version of the nutrient. The current daily dietary recommendation for choline, according to the IOM, is 425 mg daily for women and 550 mg daily for men- standards that put nearly all Americans in the deficient range. Pregnant women need more, and these values are minimum intake suggestions. 1. 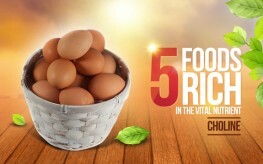 Pastured Eggs – A single egg yolk contains about 115 mg of choline. Pastured eggs should be included whenever possible, as they contain a superior nutrient profile. You can get creative with eggs by including egg yolks in your diet, adding extras into scrambled eggs, or by enjoying them in homemade custards or ice-creams which require eggs. You can even include them raw in your favorite smoothie (pregnant women should not consume raw or unpasteurized foods, though). 2. Raw milk – A single 8 oz serving of raw milk contains about 40 mg of choline. If you can’t find raw, though better since the nutrients are undisturbed, make sure to resort to organic. 3. Legumes – Enjoy garbanzo beans, lima beans, lentils and more to get around 70 mgs of choline per cup. Make sure to soak your beans so that the anti-nutrients drain away before consumption. Sprouting beans is even better! 4. Nuts – Eating pumpkin seeds, almonds or sunflower seeds can offer approximately 60 mgs of choline per cup.While eating nuts can add extra calories to your diet, they are so full of nutrition, that they are worth it. 5. Cruciferous Vegetables – Cauliflower, cabbage, bok choy, and broccoli, among other cruciferous vegetables, contain around 65 mg of choline per cooked cup. Make sure you don’t overcook them, though. Steaming or lightly sautéed in ghee is the healthiest way to get your vegetables if you don’t just eat them raw. Ghee also helps the body absorb the nutrients in the vegetables you eat. You can also enjoy choline is several meats such as liver, but for vegetarians and vegans, the above sources are just as good. Start eating your choline today and enjoy better health.